The Mate 8 is a large-scale, good-looking phone with heaps of power that ought to sit it in good stead in the phablet world. We'll be sticking with this large handset for a good length of time longer yet. Not so long ago the idea of a 6-inch phone sounded like a bonkers one. Now it's the norm for many, helped along by the iPhone 6S Plus, and with devices as powerful and refined as the Huawei Mate 8 also coming to market it's perhaps a more appealing concept than ever. Having lived with the earlier Ascend Mate 7 for a number of months in 2014 - a phone we thought we'd hate but actually loved (maybe it was ahead of its time?) - the Mate 8 steps things up a notch as the first handset to sport the super-fast Kirin 950 chipset. Does that extra power, combined with some subtle tweaks over its predecessor, make it the big-screen phone to beat all others? We've been living with the Mate 8 as our go-to handset in the UK for a couple of weeks to see whether it's the iPhone-6S-Plus-toppling king of the big phones, or an update that's just shy of hitting every mark. The Mate 8 is quite a beast, with a 157.1 x 80.6mm footprint proving a little large for most pockets - although, that said, it's actually smaller than an iPhone 6 Plus (by 1mm in height). And it's certainly not giant in all directions, with a 7.9mm thickness sitting well against most current flagship devices. This is no Windows Phone lump. For the most part the Mate 8 looks the same as the Mate 7, with chamfered metal edges and curved corners softening the look. Flip it over, however, and it shows off some design tweaks: the fingerprint scanner, which is positioned to the rear for quick access, is now a circular opening rather than a square one; while the upgraded 16MP rear camera protrudes slightly from the phone's body thanks to what Huawei has describes as "the best optical image stabilisation available" - more on that later. It has to be said that fingerprint scanner is great, just as capable as any competitors out there - iPhone and Samsung efforts included - and is quoted as being twice as fast as the earlier Mate 7, which we can certainly believe. But it's the scanner's rear positioning that makes it particularly standout. It's just a really natural placement for a device of this size; the fact it's recessed makes it easy for a finger to slip into place. The only downside, in exactly the same way as other scanners, is that moisture will mess up its ability to work - so in the rain it's no good and you'll be fumbling for a password unlock instead (oh the inconveniences of modern life, eh?). 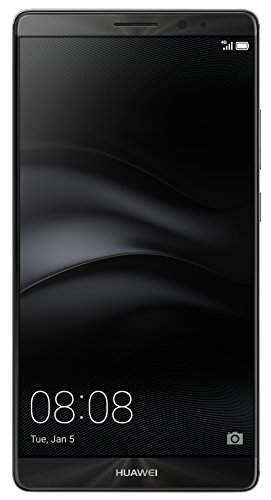 The Mate 8's hardware is a tale of two halves, with some components (namely CPU and GPU) upgraded but the majority (in particular the screen) remaining the same as the Mate 7. As the first handset to use the eight-core Kirin 950 chipset - here in its quad-core 2.3Ghz Cortex A72 and quad core 1.8GHz Cortex A53 form, alongside 3GB RAM - the Mate 8 has heaps of power, but it's only rendering to a 1920 x 1080 resolution screen. Hardly low resolution (that's Full HD after all) but at this 6-inch scale that's behind the current high expectations, especially as Huawei makes the Nexus 6P which has a 2560 x 1440 pixel 5.7-inch display. Not forgetting that even 4K resolution screens creeping into the in the likes of the Sony Z5 Premium. When we first swapped into the Mate 8 we thought the screen seemed a little magenta and therefore warm in colour balance, but it's not something noticeable in isolation. Besides we had just swapped out from the OLED panel in the (not so inspiring) Moto Force, so any change in colour was going to appear amplified. Pushed to maximum brightness and there's plenty of output from the Mate 8. However, its auto brightness can seem a little conservative in some situations, seeing us take to the settings to push brightness up a notch for best viewing experience. Colour and contrast are no problems from even steeper viewing angles as it's an IPS panel, but again brighter playback will really help things to punch that bit more. So we're a bit on the fence about the screen: the Mate 8 doesn't exactly need more resolution, especially given the limited software support (well, useful software support) for ultra-high resolution screens. So sitting on the back foot with an acceptable and battery-optimised Full HD panel might not be the worst move ever - even if it does sound out of date on paper. But back to that core power for a moment. Most phones these days have all kinds of fancy pants sounding processors with various big numbers and flashy "look at me" component names. That might look good, but doesn't always work so well in practice. Case in point: the OnePlus X (sure, it's a budget phone, but bear with us) seemed too good to be true with its Snapdragon 801 processor and 3GB RAM. Its problem? The GPU isn't an ideal match, causing stuttery performance in a number of situations, such as when gaming. The Mate 8? No such problems, even with high profile games. Even though the Kirin architecture (and Mali-T880 MP4 GPU) may be lesser known to western eyes, it does a good job in this configuration. We didn't say the same about some earlier iterations, such as the Kirin 930 in the Huawei P8 configuration - because its 2,500Ah battery and slender design couldn't last out long enough - but Huawei (which owns HiSilicon, the makers of the Kirin SoC) seems to be learning and progressing. The Full HD screen and powerful processor combine for impressive battery performance too. The 4,000mAh cell on board the Mate 8 has lasted out for well beyond a day, almost without exception. A full 30-hours isn't at all out of the question. And we're talking under proper use: we don't faff around uninstalling Facebook, WhatsApp and whatnot; this phone has had everything running pretty much non-stop and it's not unusual to see 40-50 per cent charge or more remaining after a 16-hour day. A bit more gaming and maybe you'll end up closer to 20 per cent, but there's no fear of this big phone dying on you mid-day. That kind of capacity is unusual and not affected by an ultra-high resolution screen, which obviously works to its advantage. Even if juice does run a bit low then there's the benefit of fast charge, capable of delivering 37 per cent battery from dead in just half an hour. Although you won't get that cable in the box. The only sort-of downside is power management can seem overzealous, delivering alerts about apps with high power consumption all too often. On the one hand that's great to know as it's easy to then press a button to force the app to quit. On the other it might be an app you want open, irrelevant of consumption, and there doesn't appear to be any way to set individual app preferences for these particular alerts (there are, however, app preferences as per Android tucked into the settings, to control alert notifications and so forth). Battery life is so often the downfall of a good handset these days, but not so the Mate 8. It's one of the key reasons to consider pocketing a phone this large really. Huawei uses Android as its base operating system, here in its 6.0 Marshmallow guise, with its EMUI re-skin over the top, the latter in version 4.0 which adds some interesting new features. We say "interesting" in both the positive and negative sense of the word, as not all choices are ideal. The icon designs have a kitschy look to them. More troublesome, however, is the absence of an app tray, which makes typically organised Android feel more disorganised to use. After swapping into the Mate 8 we had a whole bunch of screens littered with apps that took an age to rearrange and, at times, even locate. But - shock, horror - EMUI does brings its own benefits. Many of which could be genuinely useful, despite us genuinely not finding much use them over the last few weeks. It's almost there in a number of ways though. The first is split screen - a feature Android sorely lacks, especially for larger phone screens, and that Huawei, like Samsung, has embraced with its own software skin. Pressing and holding the Mate 8's square softkey brings up a draggable divider to run two apps between two software-based windows. Conceptually awesome, it's practically useless though. "This application does not support dual windows" reads Gmail. And Chrome. And pretty much every app. Great. No drag and drop is supported either, so there's no sharing a file to email, for example, or, therefore, almost anything useful you can do with the feature - unlike Samsung, whose app compatibility is far greater. Next up is the "knuckle" function - activated by using a knuckle rather than a fingertip on the screen - which has been improved in EMUI 4.0, so it shouldn't randomly activate as we've found with earlier versions of the operating system. We hated it in the Huawei P8, for example, because it'd fire off all the time to no avail - but it's altogether more contained in the Mate 8. Phew. It's also rather quirky. In addition to "knuckle writing" the letters e, c, m and w on screen to quick activate actions - whether opening an app, instigating a cropped screen grab, and so on, all of which are user-selectable from within the settings - there's a new double knuckle tap which activates a live recording of the screen. To explain: tap two knuckles twice on the screen and you'll see a 3-second countdown timer, then the Mate 8 captures its screen content in real-time, including external audio, so you can, for example, easily explain how-tos and save these videos to send to other family members. It's a nice idea, although might be a potential licensing nightmare if certain content is shown and shared on, say, YouTube. Third up is a voice recorder that works really well. EMUI 4.0 adds a new Meeting mode, which, by using the Mate 8's trio of microphones, identifies the source positions of audio during recording and makes it possible to select which source position is selected upon playback. Again, to explain: let's say you're sat around a table with four people, all of whom are talking at once. The Meeting mode will show audio is being picked up and from which directions, as displayed on a circular emblem to help visualise the pick-up. During playback you can then drag the microphone cursor around this circular emblem to the person to your left and you'll only hear them; continue to drag it opposite and you'll only hear that person. It works really well - great for recording meetings and not missing anything when the guy next to you has an explosive coughing fit. The Mate 8's camera application is different to generic Android too - and much faster to load than on the Nexus 6P - but despite the rear sensor now being a 16-megapixel sensor (up from 13MP in the Mate 7) the interface is largely the same as we've seen in P8 and other Huawei phones. There is the addition of a Professional shooting mode and some extras features, but why the Professional mode is buried within the camera menus we don't know - it'd make a lot more sense to have it as a left/right swipe in the same way video/beauty/time-lapse modes are accessible. But if you want manual focus on granular control over all settings then this is the place to make such things happen, which can come in handy. In the standard Photo mode the camera is operationally easy to use, with a tap on the screen acquiring focus. At times, however, the sheer size of the handset makes taking photos a little taxing, although you can use the fingerprint scanner to fire they shutter if you want. Fun. With Beauty mode activated for selfies you can expect excessively smoothed-out skin and bulging eyes, but it can be deactivated as required. We'd rather just a default selfie option really. Other filters are also available, including new watermarks - a new feature in EMUI 4.0, including relative ones such as altitude stamps, longitude/latitude and the like - while video capture is at 1080p (so no 4K this time around). One other new EMUI 4.0 feature worth highlighting is the Business Card option, accessible through Contacts, which uses the camera app to decipher and auto-fill information from a business card in front of the lens. We tried it on two different cards and it did a great job of pulling the information in. But the biggest draw of a camera is just how well it performs. In the case of the Mate 8 its images are robust, but not class-leading in our view. The ISO 50 shots we snapped in New York exhibit some grain and lack the critical bite in terms of sharpness, with processing causing a lot more softness as the ISO sensitivity rises. Dynamic range sees blown highlights that won't match a dedicated camera either, not that this is unusual. At least Huawei isn't shy to use this ISO sensitivity range, though, unlike some other makers that rely on excessively slow shutter speeds instead. Pair that with the f/2.0 lens and optical image stabilisation and handshake is largely negated, which is certainly helpful at this large scale. We've successfully shot in dim-lit subways, for example, with decent results despite the low light. Overall the Mate 8's camera setup is accomplished, largely down to its physical make-up of fast aperture and optical stabilisation rather than its default processing skills. But if you want a better-than-Android interface then this is one way to it. Just don't go too wild on the Beauty features if you want to continue looking human. But while we can't call qualms on the build quality, and find the fingerprint scanner exemplary, it's not the perfect device. The decision to leave some features just as they were on the Mate 7 sees the Mate 8 sit a little behind the curve: that Full HD screen, while fine, seems a little shy of what a 6-inch panel would really benefit from; some of the premium features from the Mate S premium, such as pressure sensitivity, lack; while the EMUI 4.0 new features sound great but lack practical purpose in some (but not all) cases - we'd love to see split screen mode be that bit more functional, for example. Largely the Mate 8's success will hang on its price, which in 32GB form (and it's dual SIM, one slot doubling-up as a microSD slot) is £429. Well, if you can find one anyway. Compare that to the 64GB iPhone 6S Plus, which costs £699, and the appeal is clear. The Mate 8 is a large-scale, good-looking phone with heaps of power that ought to sit it in good stead in the phablet world (if we're still using the phablet word in 2016, that is). We'll be sticking with this large handset for a good length of time longer yet.